The Worldwide Struggle for Internet Freedom. A book by Rebecca MacKinnon. A global struggle for control of the Internet is now underway. At stake are no less than civil liberties, privacy and even the character of democracy in the 21st century. Many commentators have debated whether the Internet is ultimately a force for freedom of expression and political liberation, or for alienation, and repression. 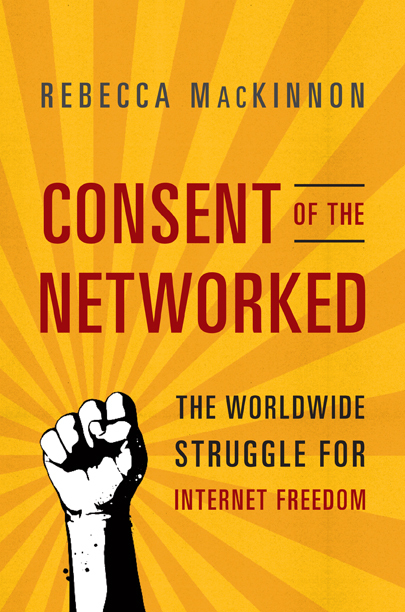 Rebecca MacKinnon moves the debate about the Internet’s political impact to a new level. It is time, she says, to stop arguing over whether the Internet empowers individuals and societies, and address the more fundamental and urgent question of how technology should be structured and governed to support the rights and liberties of all the world’s Internet users. Drawing upon two decades of experience as an international journalist, co-founder of the citizen media network Global Voices, Chinese Internet censorship expert, and Internet freedom activist, MacKinnon offers a framework for concerned citizens to understand the complex and often hidden power dynamics amongst governments, corporations, and citizens in cyberspace. She warns that a convergence of unchecked government actions and unaccountable company practices threatens the future of democracy and human rights around the world. Consent of the Networked is a call to action: Our freedom in the Internet age depends on whether we defend our rights on digital platforms and networks in the same way that people fight for their rights and accountable governance in physical communities and nations. It is time to stop thinking of ourselves as passive “users” of technology and instead act like citizens of the Internet – as netizens – and take ownership and responsibility for our digital future.